Obama cuts federal government’s carbon emissions (U.S. News & World Report): On Thursday, President Obama signed an executive order cutting greenhouse gas emissions by the federal government. The measure calls for a 40 percent reduction in heat-trapping emissions over the next decade, which the White House says is expected to save $18 billion in taxpayer money. The government will increase use of renewable energy like wind and solar power by 30 percent. Great Lakes ice in retreat (Great Lakes Echo): Ice cover on the Great Lakes has dipped below 55 percent coverage, down from 80 percent cover earlier this month. Temperatures this week are expected to hover around average, dipping below freezing at times. Daily temperature changes and wind impact lake ice coverage. 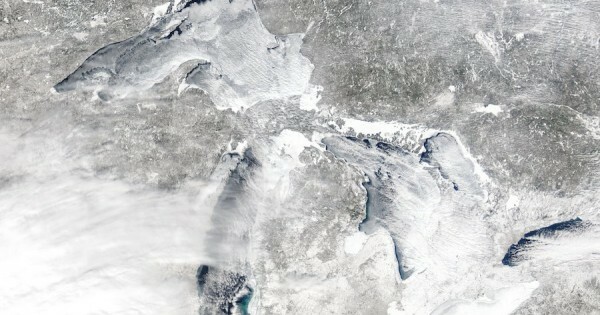 Last year, the Great Lakes were not completely free of ice until June, though observers expect ice-free waters earlier this year. Great Lakes Echo offers a cool sliding tool that shows the dramatic difference in ice coverage on the Great Lakes in just three weeks. Michigan Gov. Rick Snyder wants up to 40 percent clean energy by 2025 (MLive): Gov. Rick Snyder released an energy message last week saying he’d like to have between 30 and 40 percent of Michigan’s energy needs met by a combination of renewable energy and energy efficiency efforts. By 2025, Snyder believes Michigan could get 19 percent of its energy from renewable sources. State rep. introduces microbeads bill to protect Michigan waterways (C&G News): Michigan State Rep. Christine Greig has introduced a bill that would remove microbeads from personal care products. Microbeads, tiny pieces of polyethylene used in facial scrubs and other products, are too small to be filtered out at wastewater treatment facilities and end up in lakes, rivers, and streams, eventually reaching the Great Lakes and seaways. Similar legislation has been introduced in Illinois, while Wisconsin and Indiana are also considering taking action. It might be surprising that anyone would love the cold and snow of a Michigan winter, but it is the perfect climate for the Dark Eyed Junco. As the Robin is a symbol of the coming Spring, the Dark Eyed Junco could be called a symbol of winter. A type of sparrow slightly bigger than the ordinary house finch, Michiganders will often see these gray birds with white undersides at their feeders but only with a backdrop of snow. The slate-colored breed is the type of Junco that people in the Eastern states see only in the winter months. Dark-eyed Juncos can be found throughout the United States and Canada at different seasons. They are one of the most common birds in North America with an estimated population of 630 million individuals. Why does the Junco appear only in the winter? Juncos, like many other birds, migrate “South” for the winter months; however, lower Michigan is their South. These little birds live in Canada for the rest of the year and come down to lower parts of America only in the winter. Juncos are commonly found in coniferous and deciduous forests, but during winter migration they may journey to woodlands and fields. Where do Juncos build their nests? Juncos prefer their nests lower to the ground: in a depression, rock ledge, or roots of upturned trees. However, these birds easily adapt, and around people they may place their nest in or under buildings, in window ledges, flower pots, or light fixtures. The females weave the nests out of pine needles, grass, and sometimes small twigs. The birds may incorporate mosses, hairs, and leaves into the nests as well. They rarely reuse nests, so they will build a new nest at each of their destinations. Seeds of chickweed, buckwheat, lamb’s quarters, and sorrel are the Juncos’ favorites. At the feeders they will pick out the millet and leave the sunflower seeds. They also eat insects such as beetles, moths, butterflies, caterpillars, ants, wasps, and flies. If you see a Junco, be sure to say hello and enjoy his presence because when it starts to warm up he will be heading North in search of cooler regions. Did you see any Juncos this winter? Birders break records for Great Backyard Bird Count (Michigan Radio): Citizen scientists participating in the Great Backyard Bird Count logged 5,090 species this winter, about half the bird species in the world. The bitter cold this winter impacted the bird count, with fewer submissions this year, but still a record number of species were logged by those who did venture out. Mich. Legislature approves $2M for Ironwood-Detroit trail, plus local projects (WDIO): The Michigan Legislature approved $24.7 million in spending on 69 recreational projects around Michigan, including funding for the Iron Belle Trail from Ironwood to Belle Isle in Detroit. This will connect several existing trails from Detroit to the western Upper Peninsula with two distinct routes, one for bicycling and one for hiking. Children’s lung health improves as air pollution is reduced, study says (The New York Times): A new study published in The New England Journal of Medicine shows that reducing air pollution leads to improved respiratory function in children ages 11 to 15. The study was conducted over 17 years by researchers at the University of Southern California, measuring air pollution levels as they declined in five regional communities and breathing capacity in 2,120 schoolchildren from those communities. Several local sightings prove bald eagles making comeback (The Oakland Press): Residents in Oakland County have reported seeing bald eagles in their communities recently. Experts say the eagles may not be as rare as some people think; there are approximately 800 bald eagles in Michigan. At Stoney Creek Metropark, bald eagles have been nesting since early 2013, and residents have reported seeing eagles in Highland Township and Waterford Township.